I read a blog today about the Top 10 reasons to love the heat of summer. The author lives in a very hot area and it sounded like she had to talk herself into liking summer the same way I have to talk myself into liking winter. Well, I don’t think either of us really like the particular seasons, but we tolerate them, mostly because we don’t have a choice. I started thinking about all the reasons I enjoy summertime and realized that if I were to make a list, it would go on just about forever. Perhaps that is not the best idea. Instead, I thought it would be fun to find out what the kids like best about summer. So, I headed out into the backyard to ask them. No sooner did I make it to the back porch did I turn right back around to go get the camera. Catheryn had been playing in the sprinkler all afternoon. 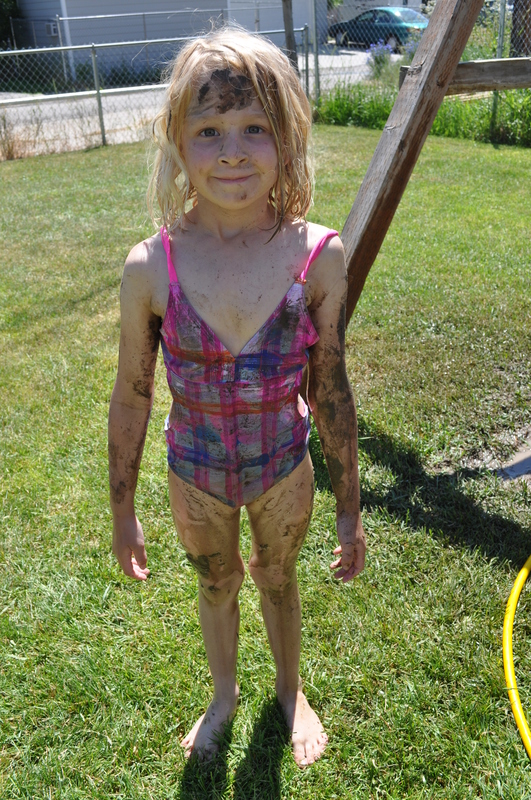 She had filled the area under the swings with water and made her own little mud hole. When I found her, she looked like a little mud monster. 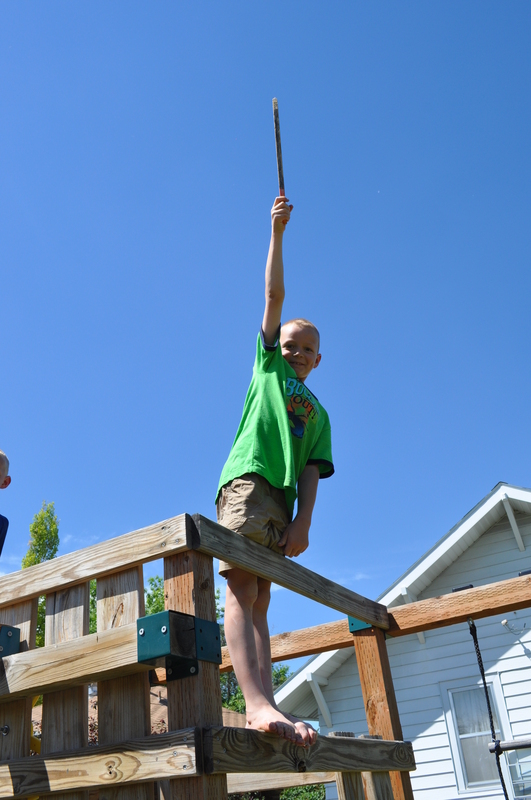 Meanwhile, up on top of the swing set, William was playing with a wooden stake. He was pretending it was a sword and he reminded me of a cross between the mouse from The Chronicles of Narnia, and Jack from Titanic. Those two were having fun, but where did Nathan go? I headed back into the house and ran into him in the kitchen. I calmly asked him what he was up to, but I honestly can’t remember what he said because I was too busy trying not to laugh. I completely forgot to ask the kids why they like summer. But I don’t think they need a reason. It’s summer. The only bad thing about it is that it ends. I suppose that makes it all the more sweeter when it makes its way back around. As for me, I am going to take the camera with me wherever I go. I wouldn’t want to miss any of these priceless summer moments. This entry was posted in Crazy Kids, Daily Life and tagged postaday2011, summer. Bookmark the permalink. Love it! You can always count on kids to make us laugh! Great pictures, Mariah! Gotta love kids and the crazy things they do! I know! They’re nuts, aren’t they?!? 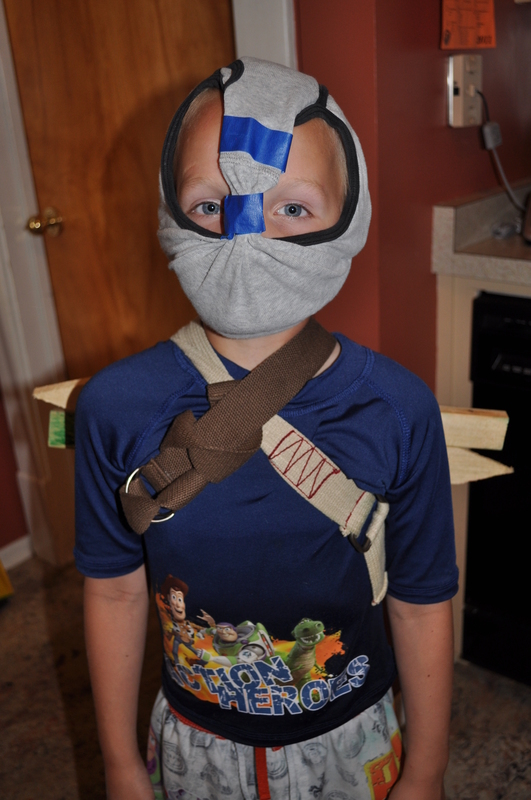 Ninja Nathan! The kid has a great imagination…I wonder if Calvin Cline started out designing like this?! That’s a great name for him! He definitely comes up with some pretty funny stuff!